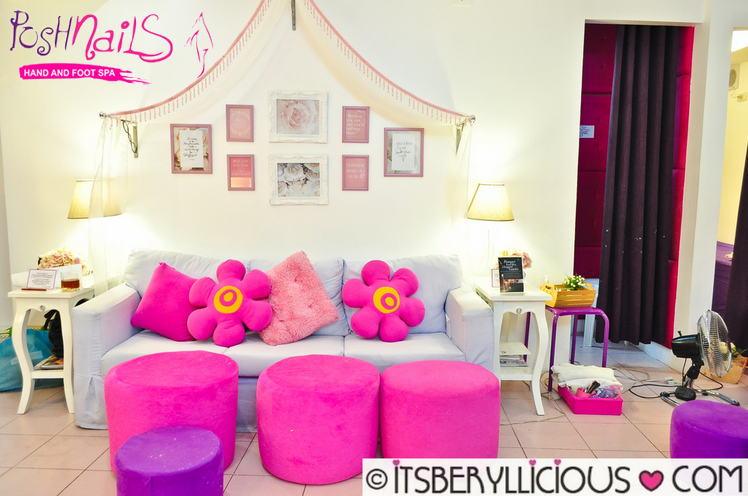 Posh Nails, one of the country's top nail salons, has been offering the best pampering experience to its customers for 13 years now. Its iconic pink and purple interiors and decors give its guests the ultimate pampering package they deserve by treating them like a princess after a hectic and busy day at work. More than just a place to have nails done, pamper queen and Posh Nails owner Cat Ilacad, envisions Posh Nails to be a place where customers can relax and unwind. With their highly-trained technicians, and top of the line quality products, customers can expect a complete pampering session that can ease all your stress away. In celebration of its 13th year anniversary, Posh Nails recently introduced a new nail salon service called DETOX Mani+Pedi, that uses tried and tested Cuccio products. It uses nature-based products that are designed to nourish and moisturize the skin, and neutralize free radicals in the body caused by stress. The service offers clients a series of process that revitalize and cleanse the skin from unwanted impurities. Along with other bloggers and celebrities, I was able to experience this Detox Mani+Pedi at Posh Nails Timog a few weeks ago. The service started with a quick foot bath followed by an exfoliating foot and leg scrub. The Detox Pedicure uses The Extended Massage Lotion which combines Shea Butter's intensive moisturizing properties, and Tuscan Grapeseed's antioxidants that neutralize free radicals and skin toxins. The Pedicure Callus Softener with Mango & Papain contains antioxidants, minerals, proteins and vitamins along with natural enzymes to gently exfoliate and reveal a radiant and healthy skin. The Pedicure Cuticle Softener with Pomegranate & Alpha Hydroxy on the other hand promises a gentle yet effective exfoliation process that cleanse and soften stubborn cuticles. The Detox Manicure service includes the Manicure Cuticle Soak with Aronia Berry & Tea Tree which softens, cleanses and refreshes hands and nails. The Manicure Milk & Honey Butter wash with jojoba beads gently exfoliate the skin while leaving it soft and supple, while the Manicure Extended Massage Lotion with Seabuckthorn & White Tea offers a nourishing and hydrating finish. The new DETOX Mani+Pedi pampering service is available in 30 Posh Nails branches nationwide. For more information, visit www.poshnails.com.ph or follow them on Facebook, Instagram and Twitter.